Blake Coleman scored 13 goals and 25 points in his first full NHL season and has now been rewarded for his success. The New Jersey Devils have agreed to terms with Coleman on a three-year contract that will pay him $1.8MM annually. The deal comes ahead of Coleman’s scheduled July 22nd arbitration hearing, which will no longer be required. The team also announced they’ve come to terms with Stefan Noesen on a one-year deal worth $1.725MM ahead of his August 1st hearing. Coleman, 26, broke out last year as an extremely effective checking option for the Devils who continuously engages physically, has the speed to create offense from turnovers and is an excellent option on the penalty kill. His 216 hits led New Jersey and put him ninth among all league forwards, and his 22 of his points came during the 12 minutes a night of even-strength ice time he received. The other three points—all of which were goals—came while on the penalty kill, putting him among the league leaders in short-handed scoring as well. Selected in the third round in 2011 (his second year of eligibility), Coleman spent four years in the NCAA honing his skills before even signing his first professional contract. He’s only now showing off the skills he can bring to the Devils’ bottom six, and has been rewarded with some stability in a two-year deal. If he can keep scoring highlight reel goals and shutting down the opposing forwards he’ll have more than rewarded New Jersey for their $3.6MM commitment. 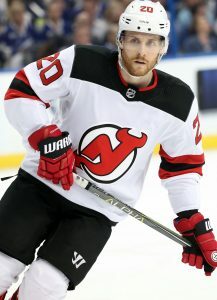 Lining up beside him for many of the defensive draws was Noesen, who also played a key defensive role for the Devils this year. Once a top prospect selected in the first round, Noesen was placed on waivers during the 2016-17 season and claimed by New Jersey. The 25-year old found some great success this past season with 27 points despite his tough role, and is being rewarded for it handsomely. He’ll still be a restricted free agent at the end of the contract, but is likely just happy he’s with an organization who gave him a full-time role.